The Maysville-Mason County Convention & Visitor’s Bureau is housed in the historic Cox Building in downtown Maysville, KY. Discover the history of Maysville, beautiful buildings and world-class museums, enjoy an afternoon of golf, or a stroll downtown. 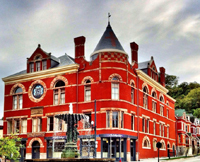 Regardless of your interests, age, or reason for visiting, the Maysville-Mason County Convention and Visitors Bureau is your primary source for Maysville accommodations, meeting sites, and area attractions. Here you will find all the information you might need while exploring the wonderful things Maysville has to offer. Personal downtown tours are available throughout the year. Tours must be booked at least 1 week in advance.